New Online Store Is One More Way For Trump To Profit From Presidency, Critics Say The Trump Organization has a new website that sells merchandise with the Trump name on it. Ethics watchdogs say it's the latest example of Donald Trump's businesses cashing in on his office. 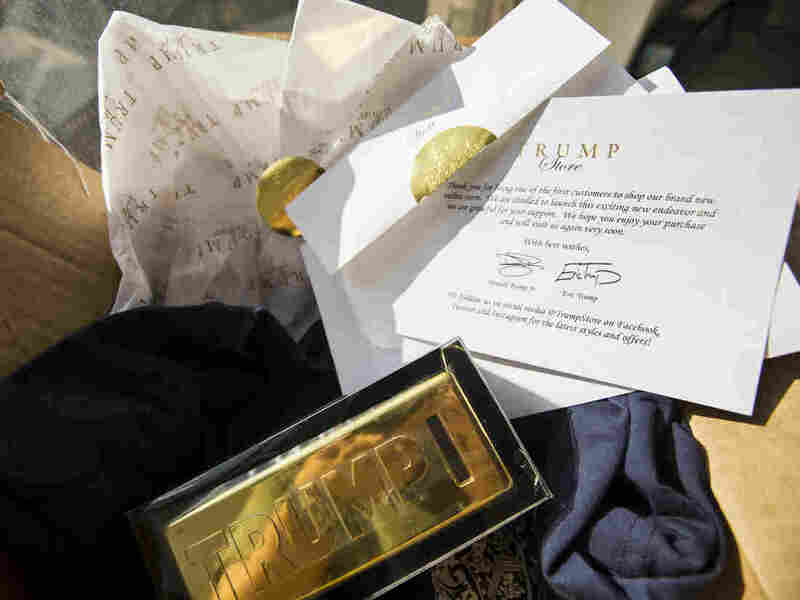 A $25 Trump "gold coin bar bank" purchased from TrumpStore.com comes with a thank you card signed by Donald Trump's sons, Donald Trump Jr. and Eric Trump. Good-government types may look askance, but Donald Trump now has a new place to cash in on his White House role. The Trump Organization recently started a website, TrumpStore.com, to sell Trump-branded merchandise such as T-shirts, baseball caps and coin banks. It's not to be confused with Trump's other website, DonaldJTrump.com. That site sells a lot of the same kind of merchandise, but its profits flow to Trump's presidential campaign. By contrast, the profits from TrumpStore.com go to the Trump Organization, which is managed by Trump's two older sons, Eric and Donald Jr., but still owned by the president himself. And the profits could be sizable. The new site sells the kind of expensive merchandise that can be found in country club gift shops, such as plush bathrobes, polo shirts and golf club covers. The items are not cheap. A white "Classic Stripe Tech Polo" shirt sells for $105, a Trump baseball cap for $35. How much it costs to make those items isn't clear, and the privately run Trump Organization didn't respond to requests for comments. But retail consultant Jan Rogers Kniffen says about half of a $35 baseball cap is probably profit. "When you look at what they're doing, they're trying to mark it up even more than department stores mark up their products," says Marshal Cohen, chief industry analyst at the NPD Group. Trump isn't the first politician to have an online Web store, Cohen notes. "What's happened is the campaign businesses have recognized that selling these support products — basically the products that people wear as billboards to show their allegiance and loyalty towards a candidate — are too big of a moneymaker for them to ignore anymore," Cohen says. But the new website is different, because the profits go to Trump himself, says Larry Noble, general counsel of the Campaign Legal Center, a watchdog group. "It fits again into the larger problem of him basically promoting his businesses from the White House," Noble says. "We haven't had another situation where a president has had a website where his business is selling things that are branded with his name." Is it legal? Noble says most federal employees are barred from profiting off their positions because of conflict-of-interest rules. But such rules don't apply to the president and vice president. "In reality he still has the right to the profits, so he will profit from whatever he gets from that, as he profits from his golf courses, the hotel, all those enterprises," Noble says.